Sunday again? It's been a manic week - and today I will definitely put my feet up and recuperate from the flurry of activity that was last week! Thank you to all those who visited our stand at Sandown - it was lovely to meet you all! 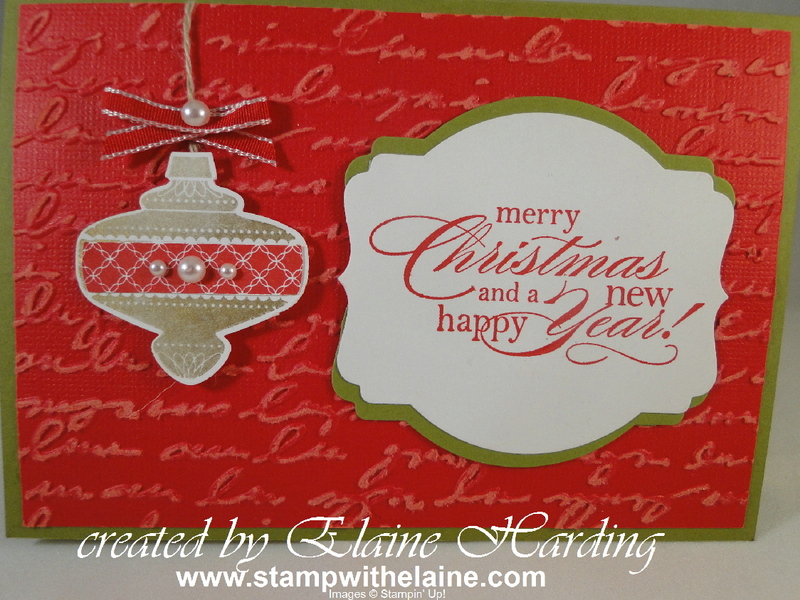 Today's card features the Christmas Collectibles new ornament punch and coordinating stamp set. I've combined old with new here - the greeting is from Delightful Dozen. I stamped the ornament in Gold Encore Ink, dried it with the heat tool, stamped another image in real red and cut out the strip to overlay on top of the ornament and added some pearls. The Pretty Print TIEF was embossed with Real Red Core'dinations card stock and sanded. The script is just scribbling and isn't in any specific language nor is it meant to be read per se. You'll find the product code at the bottom right of page 24 in the newly launched Autumn Winter seasonal catalogue. I've used the Deco Framelits to cut out my greeting and the mat. 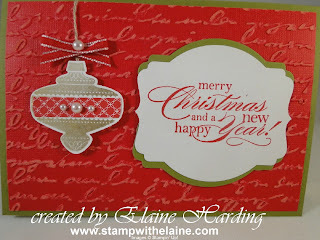 The card base and mat is Old Olive, and I stamped both the ornament and sentiment on Whisper White cardstock. Thanks for stopping by! Happy Sunday!